Chromium trioxide is an inorganic compound with the formula CrO3. It is the acidic anhydride of chromic acid, and is sometimes marketed under the same name. This compound is a dark-purple solid under anhydrous conditions, bright orange when wet and which dissolves in water concomitant with hydrolysis. Millions of kilograms are produced annually, mainly for electroplating. Chromium trioxide is a powerful oxidiser and a suspected carcinogen. Approximately 100M kg are produced annually by this or similar routes. 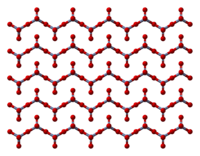 The solid consists of chains of tetrahedrally coordinated chromium atoms that share vertices. Each chromium center, therefore, shares two oxygen centers with neighbors. Two oxygen atoms are not shared, giving an overall stoichiometry of 1:3. The structure of monomeric CrO3 has been calculated using density functional theory, and is predicted to be pyramidal (point group C3v) rather than planar (point group D3h). Chromium trioxide is mainly used in chrome plating. It is typically employed with additives that affect the plating process but do not react with the trioxide. The trioxide reacts with cadmium, zinc, and other metals to generate passivating chromate films that resist corrosion. 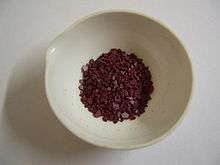 It is also used in the production of synthetic rubies. Chromic acid solution is also used in applying types of anodic coating to aluminium, which are primarily used in aerospace applications. A Chromic Acid/ Phosphoric Acid solution is also the preferred stripping agent of anodic coatings of all types. Chromium trioxide is highly toxic, corrosive, and carcinogenic. 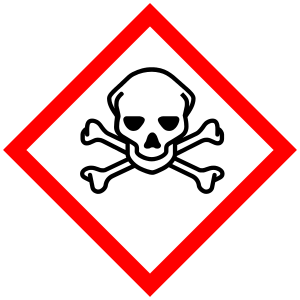 It is the main example of hexavalent chromium, an environmental hazard. 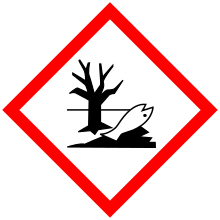 The related chromium(III) derivatives are not particularly dangerous; thus, reductants are used to destroy chromium(VI) samples. 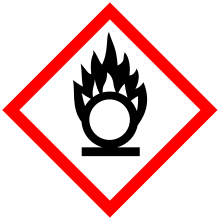 Chromium trioxide, being a powerful oxidizer, will ignite organic materials such as alcohols on contact. 1 2 3 4 5 Lide, David R., ed. (2009). CRC Handbook of Chemistry and Physics (90th ed.). Boca Raton, Florida: CRC Press. ISBN 978-1-4200-9084-0. ↑ Seidell, Atherton; Linke, William F. (1919). Solubilities of Inorganic and Organic Compounds (2nd ed.). D. Van Nostrand Company. p. 250. ↑ Pradyot, Patnaik (2003). Handbook of Inorganic Chemicals. The McGraw-Hill Companies, Inc. ISBN 0-07-049439-8. 1 2 3 Sigma-Aldrich Co., Chromium(VI) oxide. Retrieved on 2014-06-15. 1 2 Anger, G.; Halstenberg, J.; Hochgeschwender, K.; Scherhag, C.; Korallus, U.; Knopf, H.; Schmidt, P.; Ohlinger, M. (2000). "Chromium Compounds". Ullmann's Encyclopedia of Industrial Chemistry. doi:10.1002/14356007.a07_067. ISBN 3527306730. ↑ Stephens, J. S.; Cruickshank, D. W. J. (1970). "The crystal structure of (CrO3)∞". Acta Crystallographica Section B. 26 (3): 222. doi:10.1107/S0567740870002182. ↑ Zhai, H. J.; Li, S.; Dixon, D. A.; Wang, L. S. (2008). "Probing the Electronic and Structural Properties of Chromium Oxide Clusters (CrO3)n−and (CrO3)n(n= 1–5): Photoelectron Spectroscopy and Density Functional Calculations". Journal of the American Chemical Society. 130 (15): 5167. doi:10.1021/ja077984d. 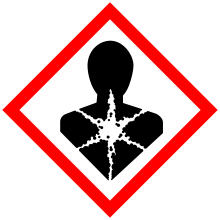 ↑ "Chromium Trioxide (MSDS)". J. T. Baker. Retrieved 2007-09-13. 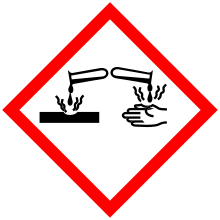 Wikimedia Commons has media related to Chromium trioxide.